MineralsRocksPlate TectonicsEarth quakes Volcanoes 100 200 300 400 500. 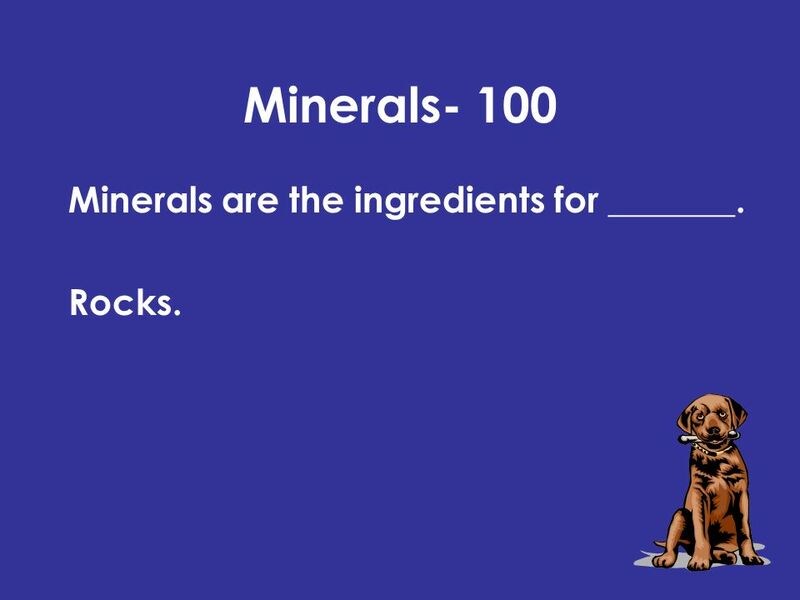 2 Minerals- 100 Minerals are the ingredients for _______. Rocks. 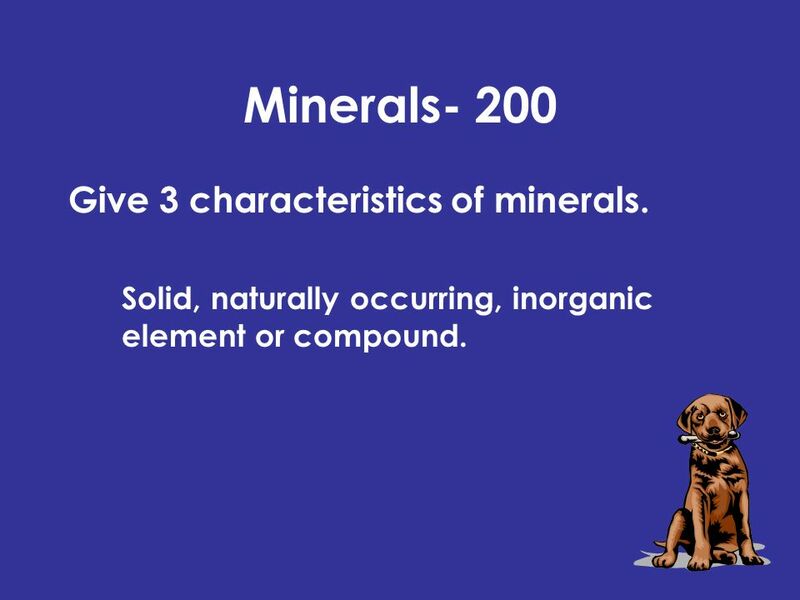 3 Minerals- 200 Give 3 characteristics of minerals. Solid, naturally occurring, inorganic element or compound. 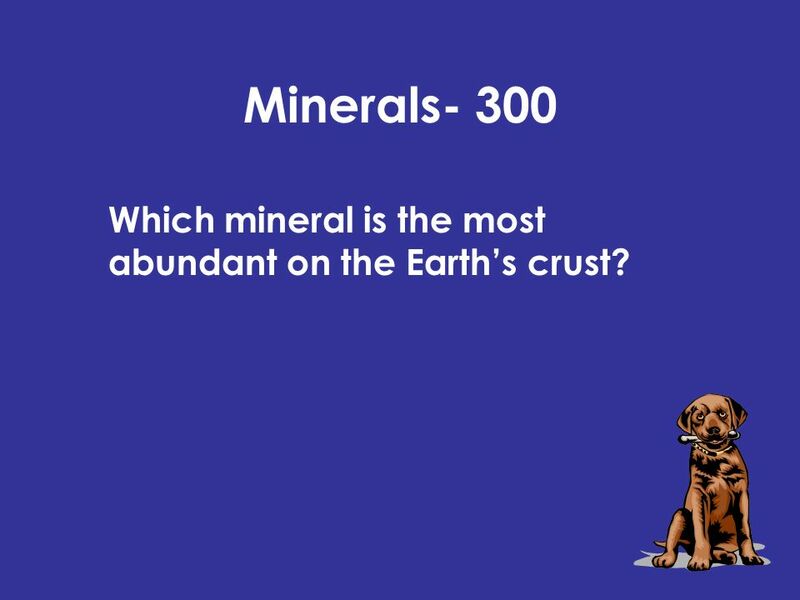 4 Minerals- 300 Which mineral is the most abundant on the Earths crust? 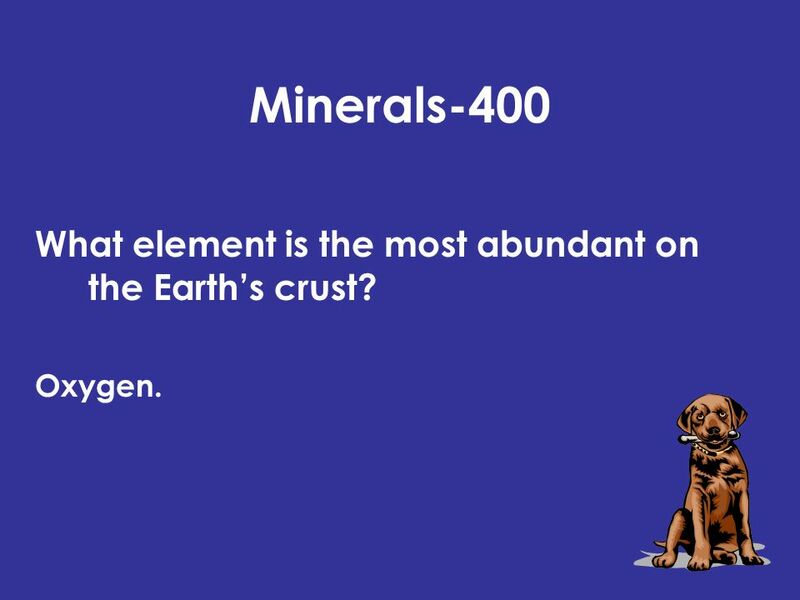 5 Minerals-400 What element is the most abundant on the Earths crust? Oxygen. 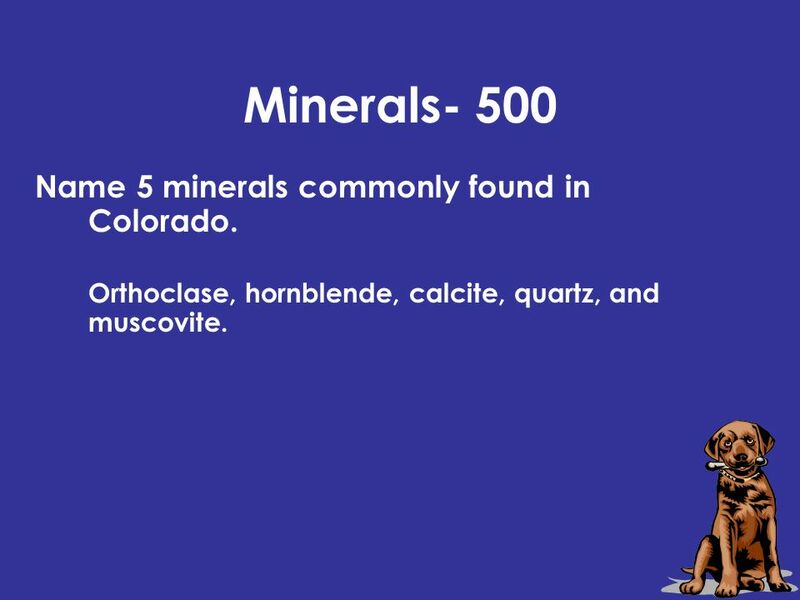 6 Minerals- 500 Name 5 minerals commonly found in Colorado. Orthoclase, hornblende, calcite, quartz, and muscovite. 7 Rocks- 100 This type of rock would have fossils found in it. Sedimentary. 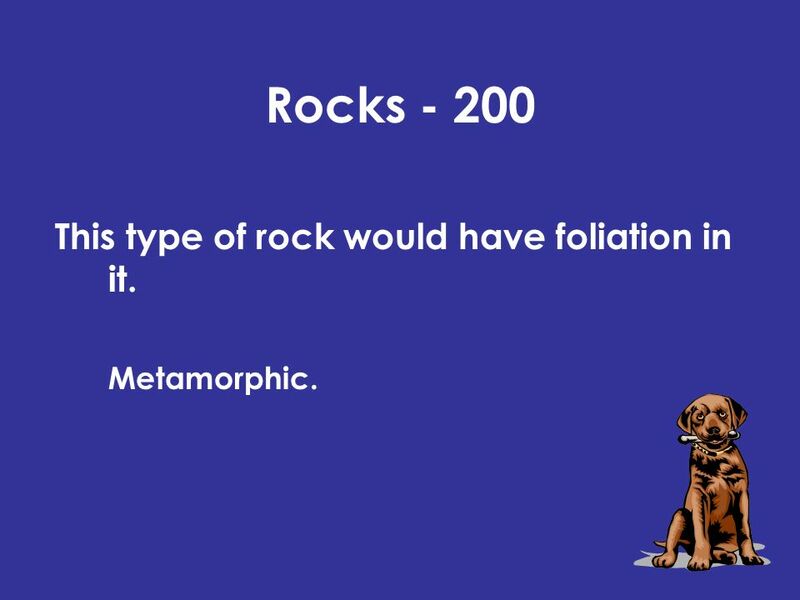 8 Rocks - 200 This type of rock would have foliation in it. Metamorphic. 9 Rocks- 300 This type of rock would have large crystals. Intrusive igneous. 10 Rocks- 400 This type of rock would have small crystals. 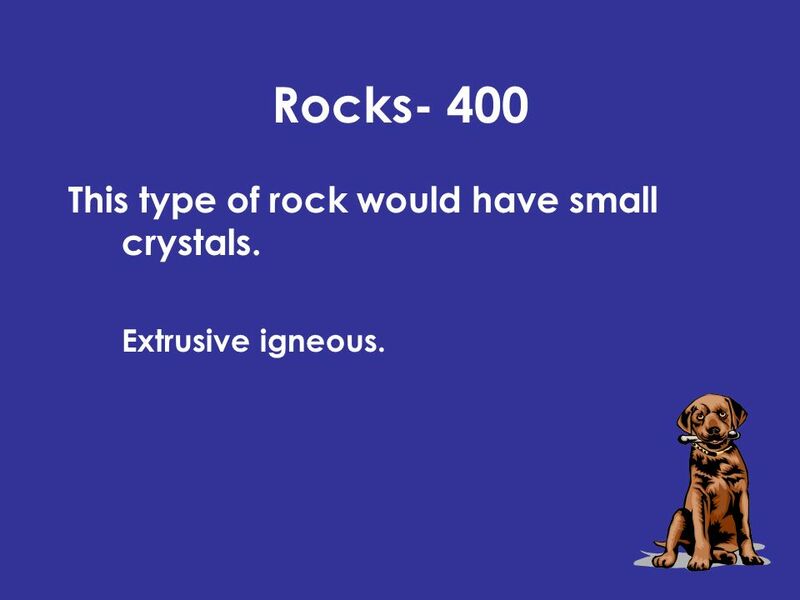 Extrusive igneous. 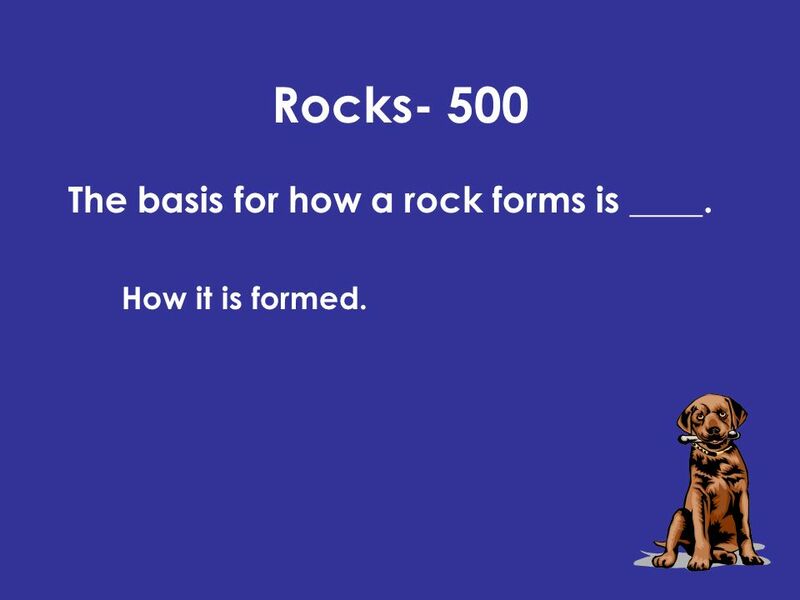 11 Rocks- 500 The basis for how a rock forms is ____. How it is formed. 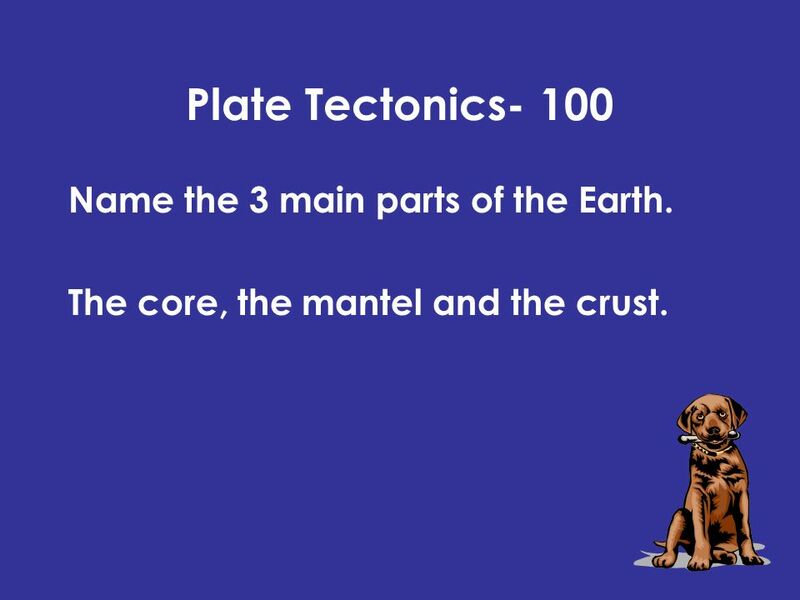 12 Plate Tectonics- 100 Name the 3 main parts of the Earth. The core, the mantel and the crust. 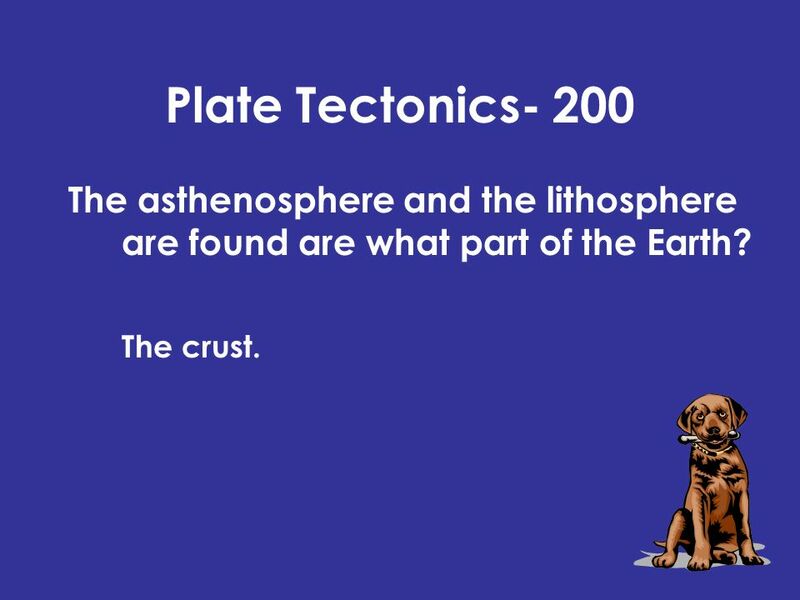 13 Plate Tectonics- 200 The asthenosphere and the lithosphere are found are what part of the Earth? The crust. 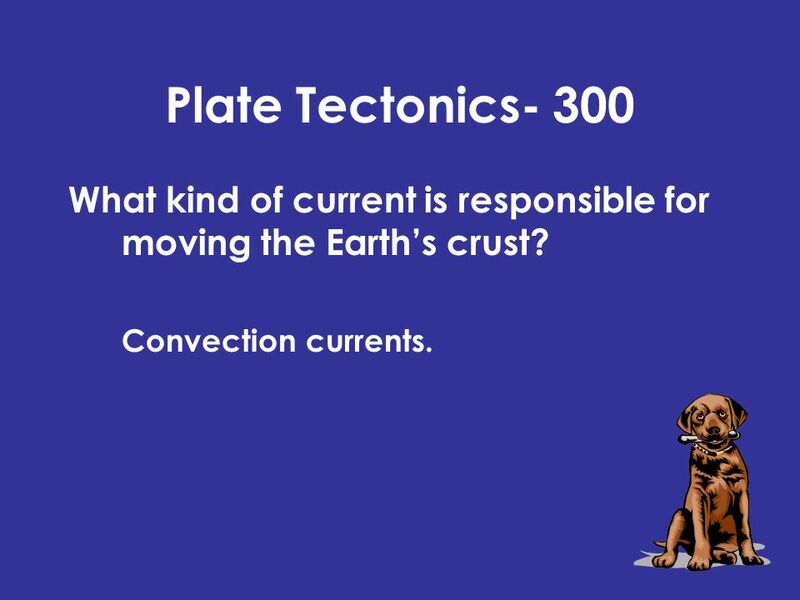 14 Plate Tectonics- 300 What kind of current is responsible for moving the Earths crust? Convection currents. 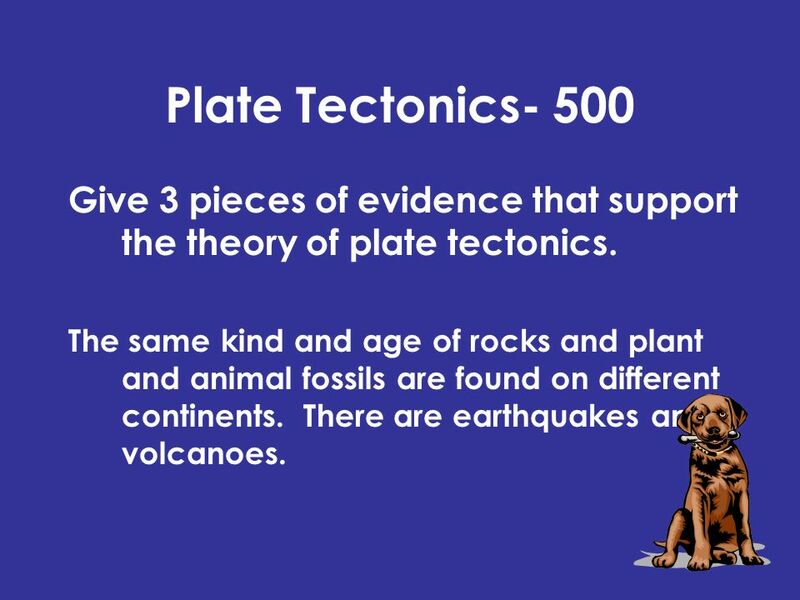 16 Plate Tectonics- 500 Give 3 pieces of evidence that support the theory of plate tectonics. 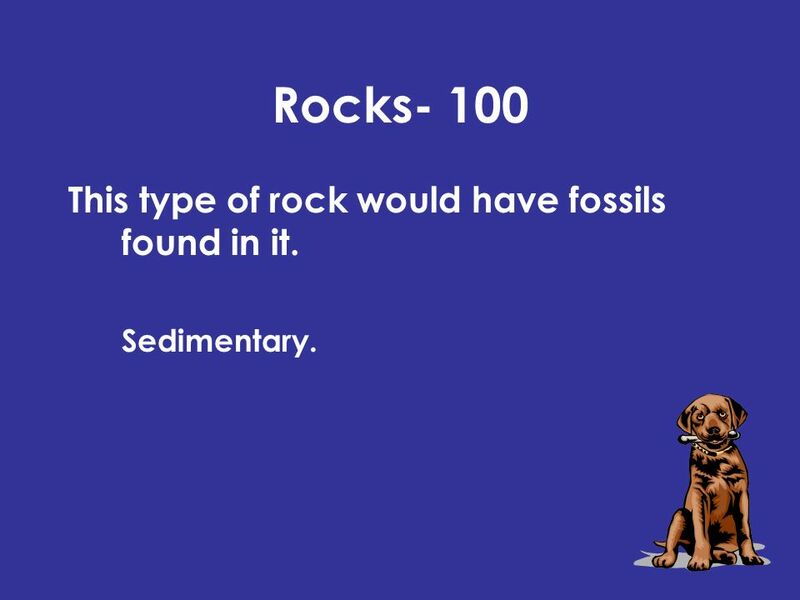 The same kind and age of rocks and plant and animal fossils are found on different continents. There are earthquakes and volcanoes. 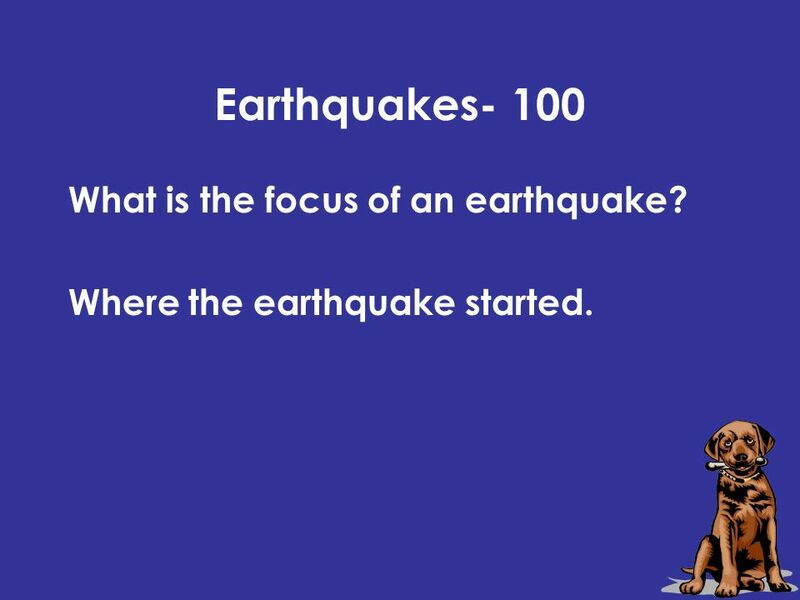 17 Earthquakes- 100 What is the focus of an earthquake? Where the earthquake started. 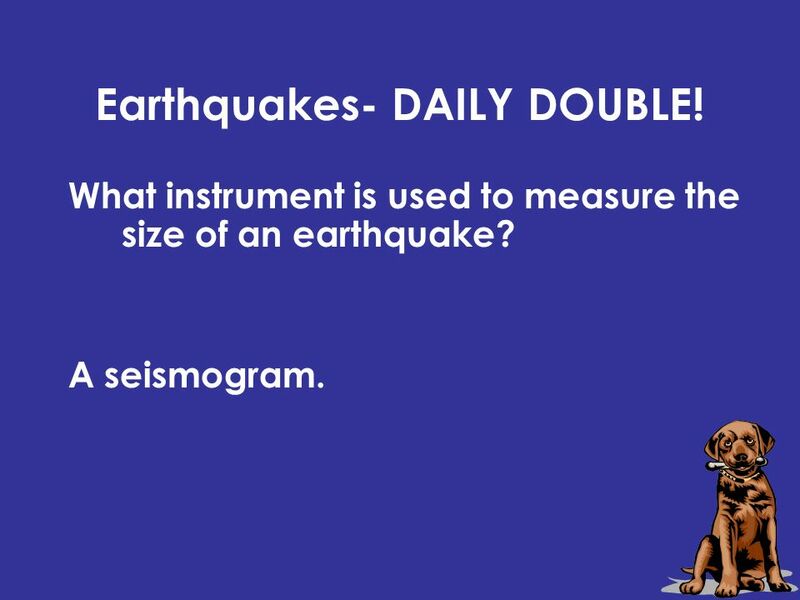 18 Earthquakes- DAILY DOUBLE! What instrument is used to measure the size of an earthquake? A seismogram. 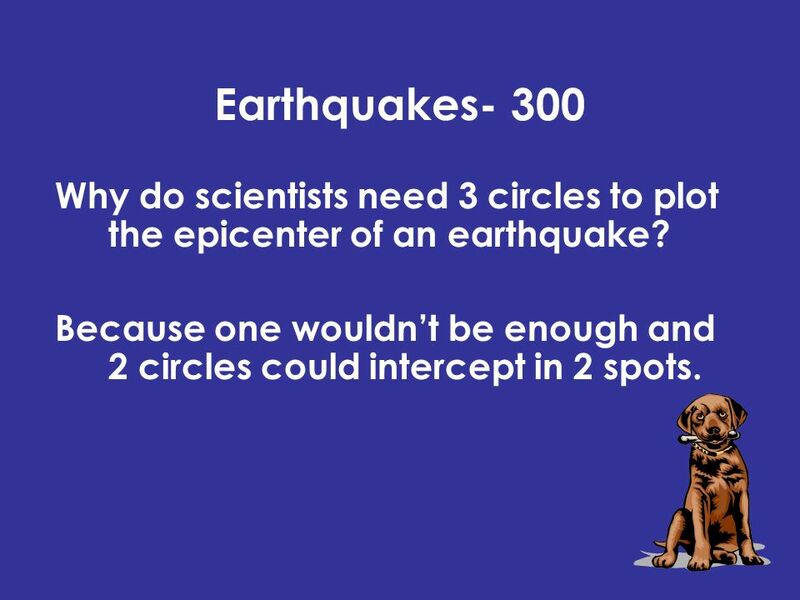 19 Earthquakes- 300 Why do scientists need 3 circles to plot the epicenter of an earthquake? Because one wouldnt be enough and 2 circles could intercept in 2 spots. 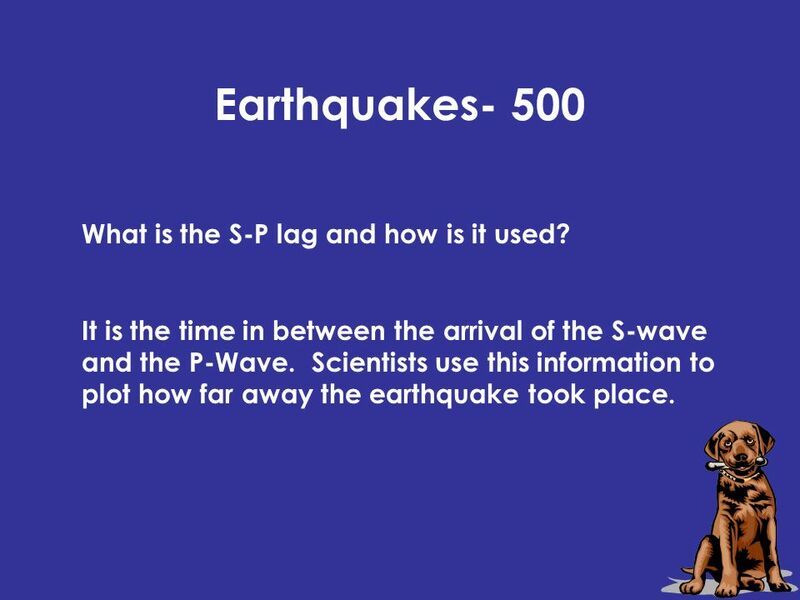 21 Earthquakes- 500 What is the S-P lag and how is it used? It is the time in between the arrival of the S-wave and the P-Wave. Scientists use this information to plot how far away the earthquake took place. 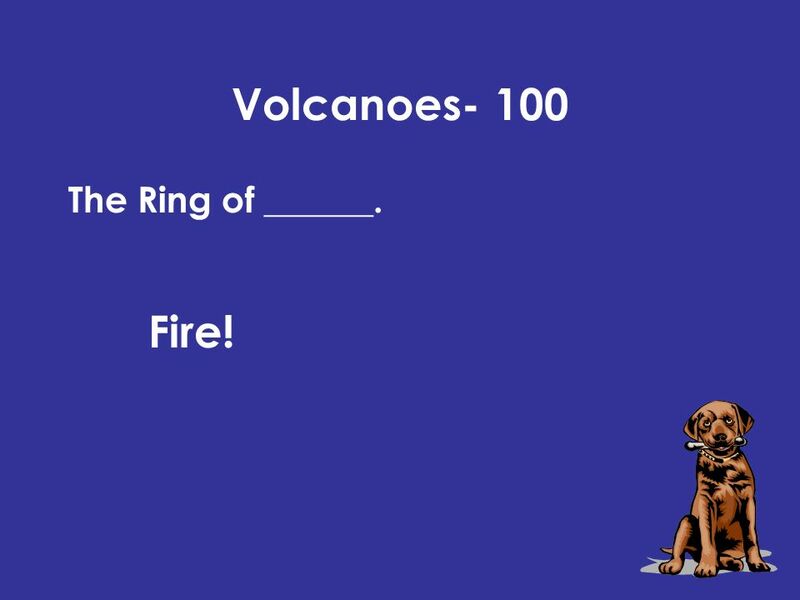 22 Volcanoes- 100 Fire! The Ring of ______. 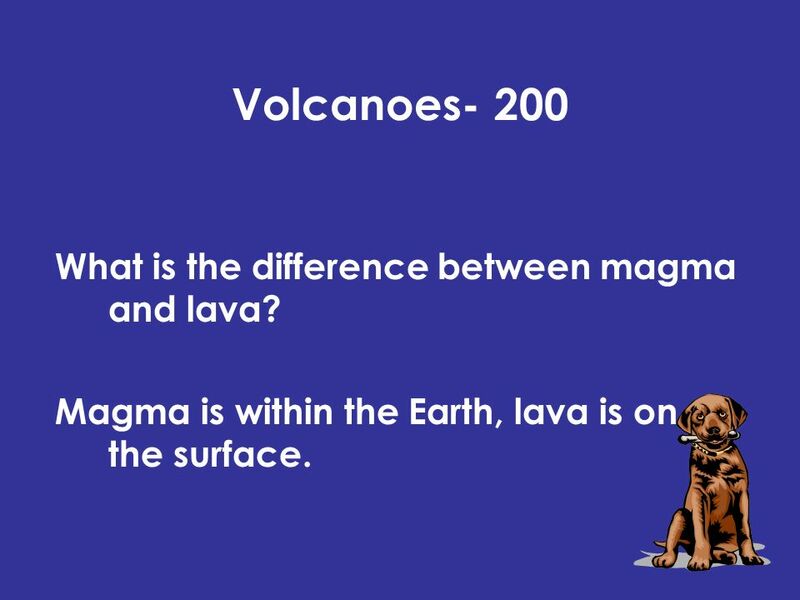 23 Volcanoes- 200 What is the difference between magma and lava? Magma is within the Earth, lava is on the surface. 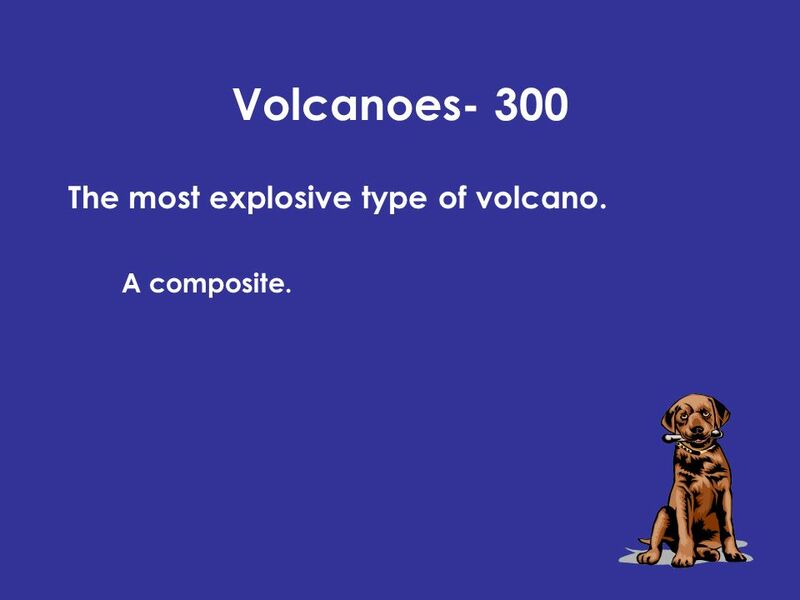 24 Volcanoes- 300 The most explosive type of volcano. A composite. 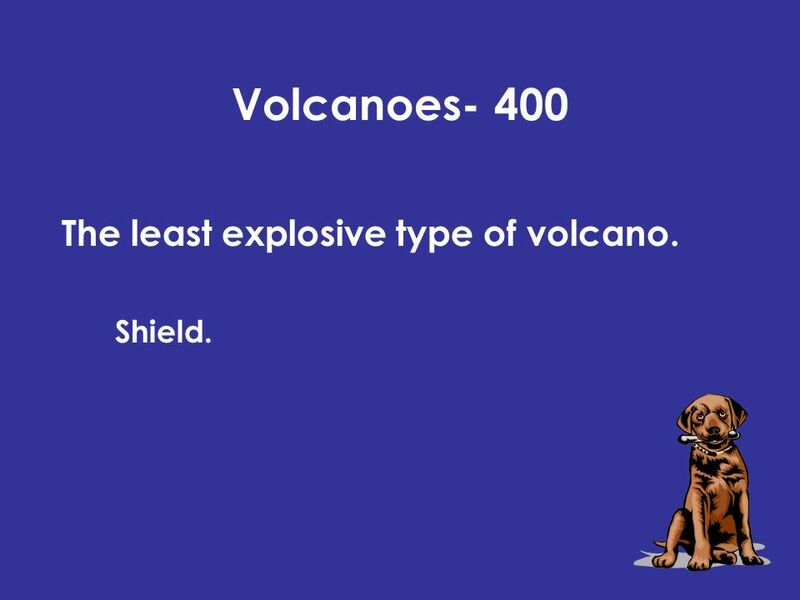 25 Volcanoes- 400 The least explosive type of volcano. Shield. 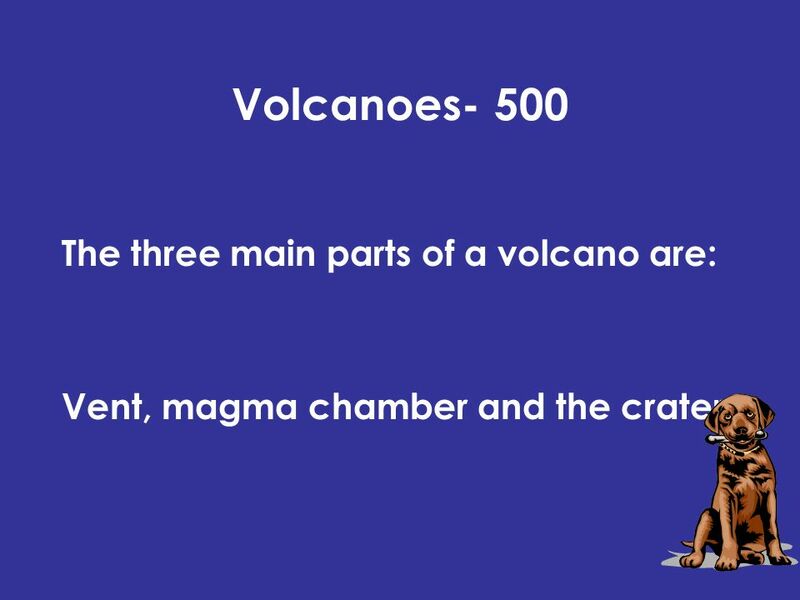 26 Volcanoes- 500 The three main parts of a volcano are: Vent, magma chamber and the crater. Download ppt "MineralsRocksPlate TectonicsEarth quakes Volcanoes 100 200 300 400 500." Teacher Instructions: This game is designed to help you review the curriculum with your students before an exam. As a teacher you will need to take the. $100 $400 $300 $200 $400 $200 $100$100 $400 $200$200 $500$500 $300 $200 $500 $100 $300 $100 $300 $500 $300 $400$400 $500. Earth Science Edition 2008 Earthquakes Earth’s Interior $ 100 $ 100 $ 300 $ 300 $ 200 $ 200 $ 400 $ 400 $ 500 $ 500 $ 100 $ 100 $ 300 $ 300 $ 200 $ 200. 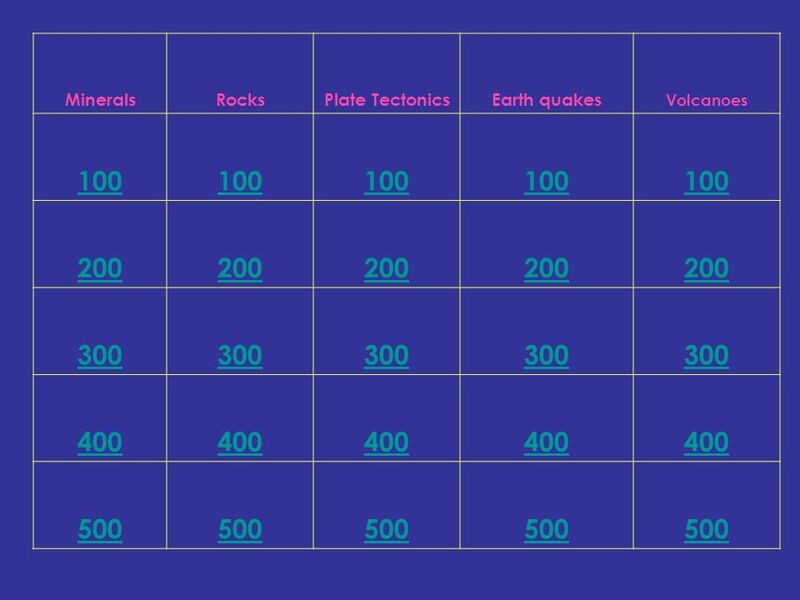 Jeopardy Minerals Rock Cycle Tectonics Earthquakes / Volcanoes Random Q $100 Q $200 Q $300 Q $400 Q $500 Q $100 Q $200 Q $300 Q $400 Q $500 Final Jeopardy. This is. Jeopardy Earth Science What are Earth’s layers made of? 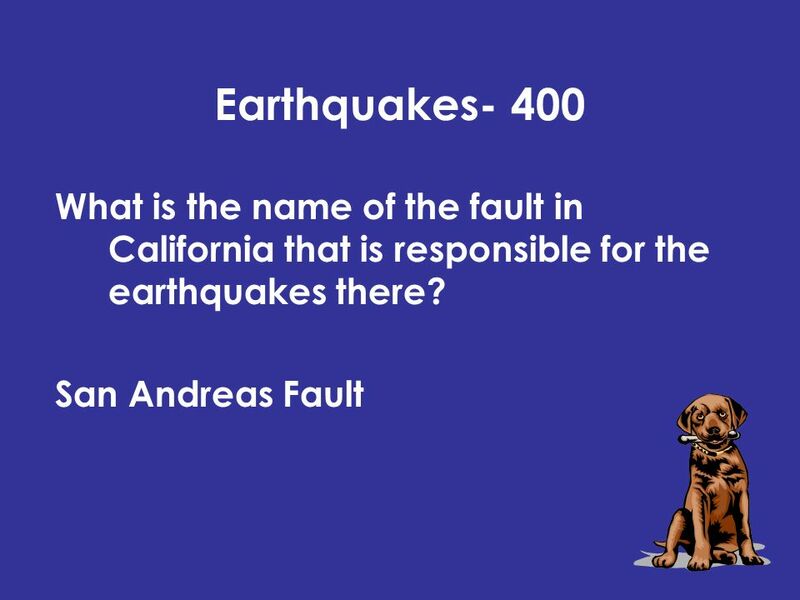 Earth’s Plates Earth’s Features Earthquakes and Volcanoes Class Questions Capture the. Plate Tectonic Test Review Answers! The Lithosphere - Tectonics. Geologic Time Scale Figure 8.1. ROCK CYCLE Page 23 of INB EQ:  How is the rock cycle related to plate tectonics? Plate Tectonics Mr. Q and Mrs. Wolfe 6 th Grade Earth Science. 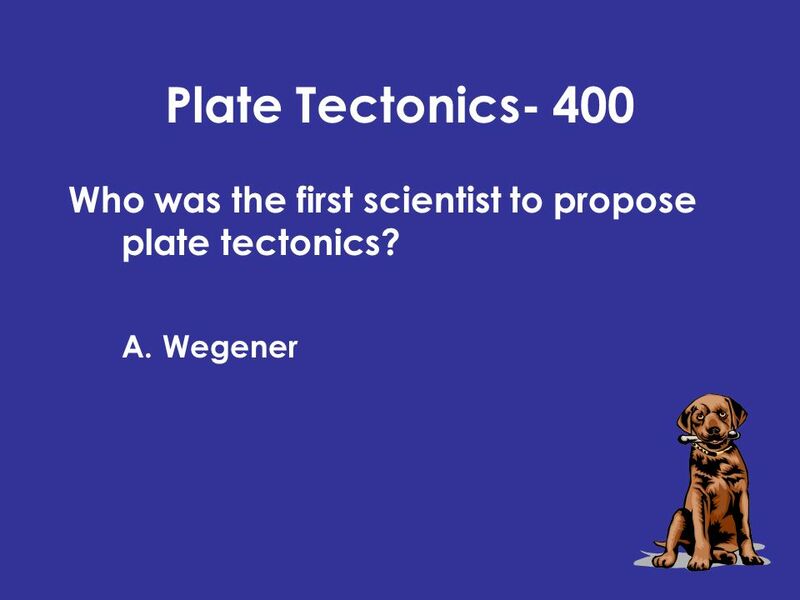 To Final Review Jeopardy Quakes & Volcanoes $100 $200 $300 $400 $500 Rocks $100 $200 $300 $400 $500 Geologic Time $100 $200 $300 $400 $500 Plate Tectonics. Board $4 $8 $10 $20 $2 $4 $8 $10 $20 $2 $4 $8 $10 $20 $2 $4 $8 $10 $20 $2 Plate Tectonics Boundaries Vocab Earth quakes PotpourriVolcanoes $2 $4 $8 $10. The Changing Earth Chapter Thirteen: Formation of Rocks 13.1 The Composition of Rocks 13.2 Igneous Rocks 13.3 How Rocks Change. 2 nd Quarter Vocabulary 7 th Grade.  Definition: The portion of the Earth’s upper mantle that is directly below the lithosphere and consists of partially.